El Niño: Fizzle or Sizzle? July was a rough month for the potential development of El Niño. Waiting for El Niño is starting to feel like Waiting for Godot. As Emily discussed in her post and as the CPC also described in the August 7th ENSO discussion, the trends were in the opposite direction of El Niño, particularly with respect to the ocean. Below-average temperatures emerged at the surface in the eastern equatorial Pacific and were widespread below the surface. The appearance of seemingly unfavorable conditions has led to some comparisons with 2012, when an emerging El Niño instead collapsed. Are we in 2012 territory again? Is this El Niño again a bust? In 2012, sea surface temperatures were certainly above their normal average, but the atmosphere remained fickle. In fact, certain atmospheric features across the tropical Pacific remained more suggestive of La Niña, the opposite condition of El Niño. Namely, rainfall was above average near the Maritime Continent (north of Australia), which is a common feature associated with La Niña. Outgoing Longwave Radiation (OLR) anomalies (departures from average) for early July - early October 2012 and for early May - early August 2014 (up to present). Blue shading indicates regions of increased rainfall, while yellow/orange shading show regions of decreased rainfall. NOAA OLR data (Liebmann and Smith, 1996) using a 1981-2010 base period. Map by Michelle L'Heureux, Climate Prediction Center. In 2014, we have again struggled to see clear atmosphere-ocean coupling (i.e. interaction). For several months, the Niño-3.4 index (which tracks sea surface temperature anomalies in the east-central equatorial Pacific) increased, but then we saw that index lose ground in July. While the weakening is likely due to the lack of an atmospheric response, the atmosphere has not looked as La Niña-like as it did in 2012: for example, the enhanced rainfall near the Maritime Continent in 2012 is absent in 2014. In other words, while the atmosphere isn’t yet acting like El Niño, at least it’s not acting like La Niña. Also, this sort of summertime lull in warming in the east central equatorial Pacific is not unique when you look back at the more recent historical record. Below is the weekly Niño-3.4 index for consecutive two-year periods during which El Niño was present during the winter. The thick black line shows values since January 2014. Two consecutive years of Niño-3.4 index values for El Niño episodes that peaked during the Northern Hemisphere winter. The thick black line shows the values of Niño-3.4 for the current year (2014) up to present. The dashed (solid) horizontal line shows where the Niño-3.4 index is equal to 0.5°C (0°C). Data based on weekly OISSTv2. Figure by Michelle L’Heureux, Climate Prediction Center. Several times in past years the Niño-3.4 temperature anomaly index lost ground for a time after an initial increase. For example, the events starting in 1994 and 2006 had summertime lulls, but went on to become moderate-strength El Niño events (peak SST anomaly ≥ 1ºC). It is interesting that these short-lived dips occurred in the June or July time period, which seems to imply that the Northern Hemisphere summer season might be a tough time for El Niño to develop if the event hasn’t already become more firmly rooted (1). As Emily showed, this recent decrease was predicted 1-2 months ahead of time (with certain models, like CFSv2 showing hints at a warming plateau since early May 2014). This advance notice strongly implies some models saw something in the climate system that accounts for the lull (we have speculated on one feature here). In contrast, during 2012, once the Niño-3.4 temperature index started to decrease, many models started to anticipate that El Niño was not going to occur. Currently we are waiting to see the latest runs from many of these models (see IRI/CPC’s mid-monthly update of the ENSO plume here), but we can examine NWS/NCEP’s CFSv2, which is run every day. Clearly, the CFSv2, unlike in 2012, is not favoring a bust at this point. Though some members (thin lines) suggest that outcome, so it cannot be ruled out either. NCEP Climate Forecast System (CFSv2) predictions of the Niño-3.4 index made on October 12, 2012 and August 12, 2014. Index values greater or equal to 0.5°C (see y-axis) for consecutive seasons are considered El Niño episodes. The thick black line is the observed values of the Niño-3.4 index. The thick dashed line is the ensemble average of the individual forecast members, which are displayed as the thinner lines. Figures by Wanqiu Wang, Climate Prediction Center. In summary, we continue to favor the emergence of El Niño in the coming months, with the peak chance of emergence around 65% (i.e. there is a 35% chance of El Niño not occurring). ENSO forecasters do not expect a strong El Niño (we can’t eliminate the chance of one either), but we are not expecting El Niño to “fizzle.” In fact, just in the last week, we have started to see westerly wind anomalies pick up near the Date Line. Literally and figuratively, we may be witnessing the start of ENSO’s second wind. (1) One Northern Hemisphere summer feature is an east-west “band” of tropical rainfall that is normally positioned north of the equator. This band is called the Inter-tropical Convergence Zone (ITCZ). Because most tropical rainfall falls in this region, changes in intensity or departures in the position of the ITCZ will sometimes result in anomalies north of the equator. The formation of ENSO events, on the other hand, is usually associated with anomalies in rainfall and winds that occur directly on the equator. re: El Nino regaining strength? I read a couple of articles today that suggested that El Nino is (or may be) regaining it's strength/development. I don't remember where I read them , but I think one was from an Australian news service. Do you think it's possible that as the seasons change now and the southern hemisphere heats up, that will be enough to get El nino going? RE: re: El Nino regaining strength? The exact reasons for why we may see a "second wind" of development remain mysterious to us. While ENSO is an anomaly (i.e. departure from the average or departure from the normal seasonal cycle) it is "phased locked" to the seasonal cycle, meaning that it tends to form sometime during mid-year and then is at its maximum around the Northern Hemisphere winter. So clearly the seasonality plays an important role in ENSO. With this no happening and it possibly not happening at all, will that put the La Nina at high possibility and along with that do you think we will have a repeat of last years brutal winter? RE: El Niño: Fizzle or Sizzle? I have been looking at the monthly Oceanic Heat Content (OHC) data from CPC and seem to have a correlation (with 2 major caveats) When looking at the difference between the average OHC in bin 160E to 80W and bin 180W-100W, the monthly delta between these *seems* to be a diagnostic predictor of ENSO. In my very cursory analysis the current biannual changes in the OHC do not support an El Nino, but rather a warm neutral ENSO; basically ONI below +0.5 through the upcoming winter. CAVEAT 1: The OHC data from CPC is available from 1979 on, so it is possible that I'm seeing a sample size issue. CAVEAT 2: I used the BEST and MEI data to define ENSO versus the ONI data from CPC. Obviously, a lot more work is needed in this area. RE: RE: El Niño: Fizzle or Sizzle? 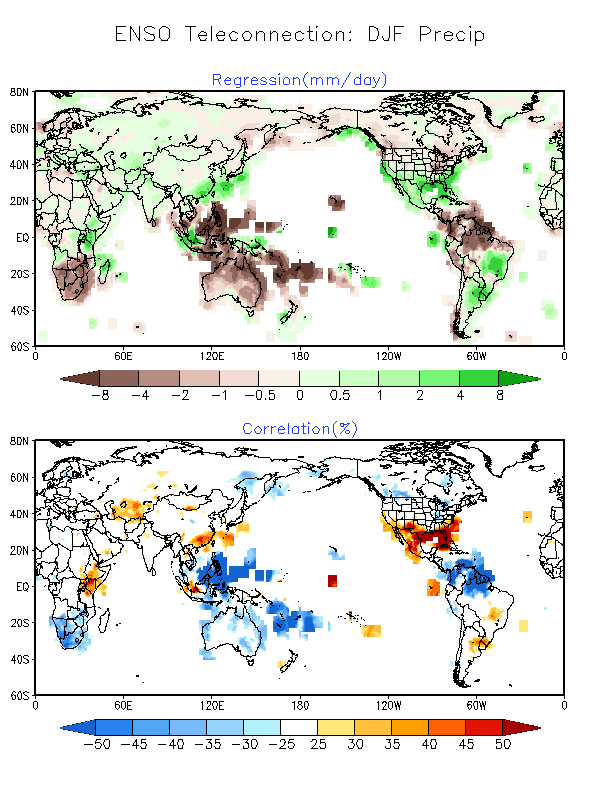 In general, anomalies of subsurface temperature move from west-to-east along the equatorial Pacific. So, if your heat content index is shifted westward of another index, then there will likely be lead-lag correlations. In general, oceanic Kelvin waves take ~2-3 months to cross the Pacific and are one of our predictors for ENSO (not our only one!). Your caveats are spot on. Taking in account sample size and using multiple datasets are excellent practices to follow. Have personally witnessed severe dry season in malaysia, thailand, indonesia singapore (MTIS) corridor from Early JAN 2014 till late July ear august. Severe dry season and erratic rains, pre monsoon rains and displaced rains in the Pakistan - India region whereby the rains were extremely deficient. Until 2 weeks ago; it reversed completely and the indicator are green from red. What is your prognosis for us getting moderate to strong El Nino rainfall patterns in Southern California? I noticed some strong monsoon rain storms with Easterly inverted waves at time this summer in the Desert Southwest and Northern Mexico. This has occurred in past El Ninos such as 1976-77 (Hurricane Kathleen), 1977-8 (2 tropical storms in August in SoCal), and 1992-1993 (inverted wave generated heavy thunderstorms San Diego mountains with 4"-6" rains in .1992). These were not near the equator but in the 32 deg. latitude zone. Does the ITCZ move further North in El Nino years? During El Nino, the ITCZ typically moves equatorward. With that said, in part due to increased warmth in the tropical eastern Pacific, El Ninos favor a more active eastern Pacific tropical cyclones. A few questions: 1.) Is there evidence of another kelvin wave developing? If so, do you know of a link that tracks actual data? 2.) The article mentioned westerly wind anomalies have recently started showing up near the Date Line. What specific areas near the Date Line (latitude and longitude) would one track for this anomaly? And to what extent has this wind shift occurred in previous El Nino events (all of them, some of them, or other?) It makes sense that the wind shift would help warmer surface temps move east instead of west if the trade wind pattern was altered... but has this been a common occurrence with most El Ninos in the past? These are all good questions with uncertain answers from my perspective. There is no one distinct area that is important. Any wind anomaly over the equatorial (5S-5N) Pacific is something to watch and monitor because of its potential influence on surface and/or subsurface temperatures. In general, wind anomalies that are persistent or strong (i.e. for El Nino, not just westerly winds in the *anomaly* but also in the *total winds*) have more of an impact than more fleeting, weaker anomalies. As for the impact of the most recent westerlies, I believe it has already helped to keep some of the surface warmth in place (for example, we saw an abatement in the decrease of the Nino-3.4 index over the past week). Whether it helped to force a new oceanic Kelvin wave, that still needs to play out a bit more in the observations, but there is a chance it did. Ca. had one major meteorological event for fall2013/winter2014 and it was the storms that were heading for Ca. were being forced up and over the persist omega ridge blocking just about every single storm and sending them to the Northwest region and there were many storms. My decades of living in Southern Ca. I've never experienced such as the day's after day's of Santa Ana Winds. Is it possible again even with an El Nino in place? We just better hope it doesn't happen again. I am a native Arizonan and it seems that the "monsoon" season in Arizona is occuring later than usual this year. We had "nothing" in June and July but August has been very active with afternoon and evening (and even some morning) thunderstorms with much wind. Is the late arrival of the "monsoon" any indication of a possible El Nino winter in Arizona? In southern Africa we have become accustomed to associating strong El Nino events with severe droughts. Presumably this is not going to happen this year, but all the discussion I see seems to refer to the northern hemisphere and mainly confined to the two sides of the Pacific. Is there any thinking about how climate change is affecting El Nino development ? We know that the melting of the Antarctic ice is affecting currents and wind patterns over the Southern Ocean. Does this not have an effect further north ? Thanks for the comment Peta. You are certainly correct in noting that El Nino's have a global impact (and not just in the northern Hemisphere). You can see here the precipitation patterns for ENSO events in December-February for the globe. In the top picture, it can be seen that there is a dry signal in southern Africa during El Nino events. As for climate change and ENSO, stay tuned for future posts.